Pathways: "7 Habits" : A Management Guru Stephen Covey - passed away. "7 Habits" : A Management Guru Stephen Covey - passed away. 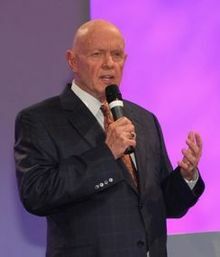 Stephen Covey , The author of the best seller "7 Habits of highly effective people" passed away. I hooked to this book ,when I just passed out of engineering college. Since then I kept visiting this book , as well as the workbook and his website often. In my opinion if one is allowed to pick up only one self-help book , one should pick up "7 Habits" . No wonder it is best seller for many years and the author is regarded as a management guru for well known established firms. Though he had other books to his credit, 7 habits is the best of them all. 7 Habits is wonderful book. The habits rests one on another, they are interlinked. The book has whole ecosystem of workbook, website, audiobooks and training courses based on it. So for every taste of learning style , there is serving resource. So get "7 Habits" on your priority list this year for further development. And ,may his soul rest in peace.